It all starts with one farmer like Joe Fitts in Independence, Ore. who donated an acre of sweet corn to Farmers Ending Hunger. That’s 20,000 pounds of fresh sweet corn for the Oregon Food Bank Network. The net result is 10 pounds of fresh produce for about 2,000 food boxes that feed hungry families. Another example is Bruce Simonson, a farmer in McMinnville, Ore. He planted eight acres of sweet corn, all dedicated to food banks. 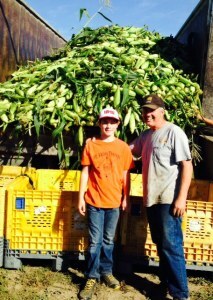 He’d had a crop failure and rather than let the prep work and fertilizer go to waste, he and his son decided to plant sweet corn. In October, a crew of farmers, volunteers, food bank staff and other community members harvested 90,000 lbs. of fresh sweet corn for the hungry. This story is repeated farmer by farmer and acre by acre all over Oregon, as farmers, ranchers and food processors join Farmers Ending Hunger to help hungry Oregonians. In 2013, total donations amounted to approximately 2.5 million pounds, and we expect the amount will be larger by the end of 2015.